This book is the third in EvroÃ†s multi-volume, decade-by-decade series covering the entire history of Formula 1 through its teams and cars. This instalment examines the 1980s, when the sport moved into its spectacular turbo era, first with Renault, Ferrari and BMW-powered Brabham, then with sustained periods of success for McLaren with Porsche-made TAG engines and Williams with Honda power. After the last win for the evergreen Ford Cosworth DFV in 1983, turbos prevailed until regulation change for 1989 brought back normally aspirated engines, now of 3.5 litres. Besides Formula 1Ã†s high achievers, this book also covers the entire supporting cast, where much curiosity lies in discovering the travails of obscure and unsuccessful cars. 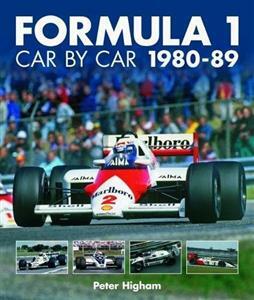 This wide-ranging, colourful and authoritative book will be treasured by all Formula 1 fans. Ã² Year-by-year treatment covers each season in fascinating depth, running through the teams Ã¹ and their various cars Ã¹ in order of importance. Ã² Two teams dominated the decade, McLaren and Williams taking all but two of the driversÃ† and constructorsÃ† titles: McLarenÃ†s World Champions were Niki Lauda (1984), Alain Prost (1985, 1986 and 1989) and Ayrton Senna (1988), while WilliamsÃ†s were Alan Jones (1980), Keke Rosberg (1982) and Nelson Piquet (1987). Ã² The two other significant winning teams were Brabham, which took Nelson Piquet to two driversÃ† titles (1981 and 1983), and Ferrari, which won two constructorsÃ† titles (1982 and 1983). Ã² Other winning marques were Benetton, Ligier, Lotus, Renault and Tyrrell. Ã²Over 600 photos Ã¹ entirely in colour and all from the magnificent archives of LAT Images Ã¹ show every type of car raced by every team and driver, presenting a comprehensive survey of all participants. Ã²The sweep of the decade covers sustained technical advances, particularly in carbon-fibre construction and ever-increasing power outputs.